1. Snow White, 2001 movie (Michael Convertino) - The movie I remember most from my childhood and this particular piece makes me both happy and sad at the same time. I love the other soundtracks from the film but alas, cannot find them upon the internet! I love the finale, when the film is resolved and they are riding off in to the sunset. 2. Tchaikovsky's Nutcracker Suite - I love the vast array of instruments, especially all of the woodwind varieties. My very favourite is 'Waltz of the Flowers' - I can never resist a waltz as it is so rhythmic and soothing to listen to! 3. Doctor Who's 'Clara's Theme' (Murray Gold) - It's no secret that my favourite incarnations of Clara were Oswin Oswald (Asylum of Daleks - she definitely made opera favourable to listen to!) and Victorian Clara - most sophisticated, competent companion, in manner and by attire, and had a fairytale theme to match that was purely reminiscent of that of one of Disney's Princesses. It is perfect for setting the scene of the tardis sleeping unnoticed above the clouds of Victorian England. 4. Little Women's 'Spring' (Thomas Newman) - The whole soundtrack of the film is beautiful and moving and I admire how the music creates that sense of time passing, of characters growing, as it is following Meg, Jo, Beth and Amy as they graduate from childhood and begin to understand and undertake the responsibilities of adulthood, including marrying and settling down. This piece is particularly heart-rending, it follows the quote "change will come as surely as the seasons and twice as quick. We make our peace with it as best we can". 5. Pride and Prejudice's 'Liz on top of the World' (Dario Marianelli) - This is such an intricate piece of music, it reminds me of rain outside the window or being out in the fields before dawn, hence the quote "your hands are cold". Here's how it was used in the film, with Lizzie Bennett out enjoying the mountainous terrain of the Peak District. I like how it is celebrating her independence as she does not need to marry to be happy or improve herself, she is perfectly content. These make me feel like watching the features all over again! 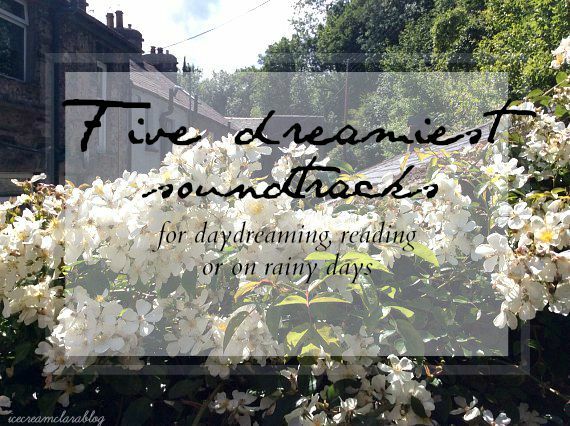 Do you listen to music whilst blogging, reading, or even upon a grey day? I love getting inspiration from music. There's some great songs on this list!